With the support of a CONICET grant to Dr. Christopher Anderson, concrete strides are being made to strengthen research between Tierra del Fuego and Alaska. From November 2014-February 2015, distinguished scientist Dr. Merav Ben-David from the University of Wyoming conducted a sabbatical at the Austral Center for Scientific Research (CADIC) in association with the Argentine National Parks Administration (APN). 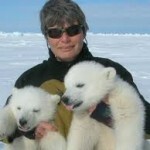 Dr. Ben-David is a recognized expert in wildlife biology and management, particular in polar and sub-polar biomes in North America, where she works with species like otters, mink, beaver and polar bears, among others. During her time in Tierra del Fuego, she offered two workshops for local researchers and students, regarding non-invasive methods of estimating animal populations and using stable isotopes in ecological research. She also conducted extensive field work with Dr. Alejandro Valenzuela in Tierra del Fuego and Glaciers National Parks to get to know the situation of the endangered southern river otter (Lontra provocax) and the invasive American mink (Neovison vison). With Dr. Andrea Raya-Rey she also participated in studies on Magellanic penguins (Spheniscus magellanicus). Finally, in association with the Center for Quaternary Studies (CEQUA) in Punta Arenas, Chile, she is advising a scientific tourism project on the cruise ships of the Australis company, assisting in the integration of citizen science methods to this initiative. Based on these efforts to re-enforce relationships between the polar and sup-polar regions of North and South America, new projects are being developed. In June 2015, Dr. Valenzuela of the APN will travel to Alaska to participate in coastal otter monitoring programs, and plans are being made to present new training grants for Argentine and U.S. students to work in both Patagonia and North America on similar issues related to wildlife and conservation issues.